My daughter is a huge shrimp fan and the inspiration behind this dinner recipe for kids. She can eat a handful of cooked shrimps as a snack, add them to her pasta dish or eat them on a skewer. I usually buy frozen cooked shrimps as it is easy to prepare but obviously fresh shrimps would be better. I had the chance to taste some during my trip to Myrtle Beach and I am having hard time adjusting back to frozen cooked shrimps! The following recipe is a great dinner recipe for kids. It is colorful and I used mini quiche molds to create a kid friendly serving. After all, kids eat with their eyes and they love cute shapes, don’t they? I would not recommend this dish in a lunch box as it is tastes better when heated. Besides shrimp can turn bad when it sits, even with an ice pack in the box. 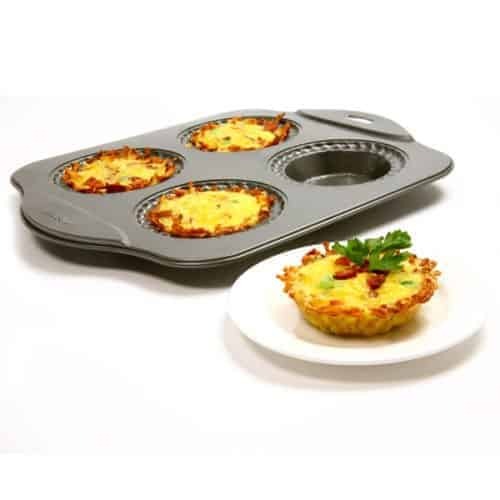 You can use the below quiche mold or use aluminum foil ones. I prefer the below mold as I can reuse it several times. Crust. You can use the crust recipe from my spinach quiche. 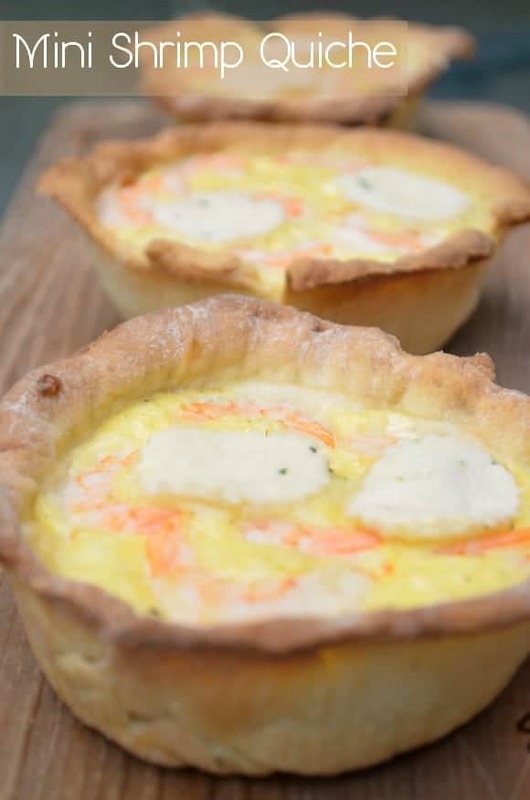 This crust recipe will yield lots of mini quiches and around Two 9 inch quiche. I usually bake half of it and freeze the other half. 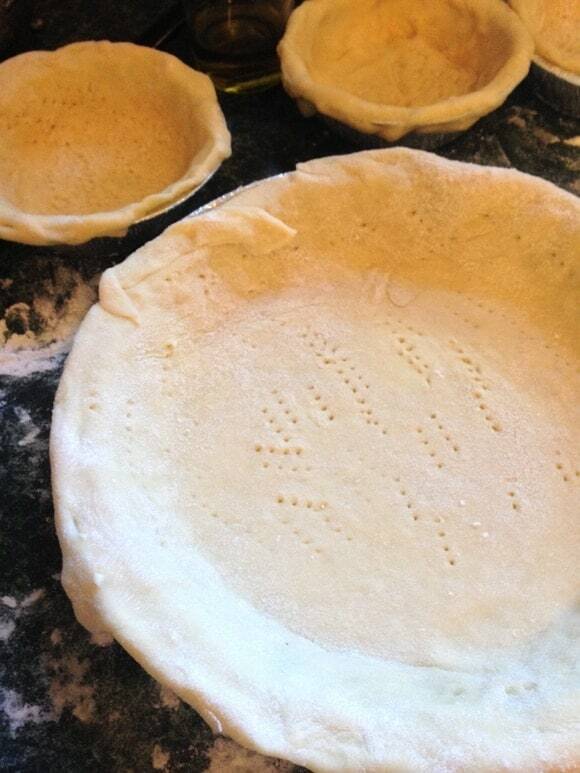 I freeze the crusts unfilled, uncooked in individual quiche molds. It is pretty handy for those on the go days: just put them in them in the oven for 15mn, add a quick filling and serve. 1 cup of cooked shrimps. Make sure to drain from water. ½ cup of grated cheese. I used cheddar cheese. Cook the crust as the direction in the spinach quiche. In a medium bowl, whisk the shrimps, cheese and egg. With a cookie cutter, make shaped decorations to decorate. Once cool, it’s time to dig in and enjoy! My kids love eating that brown crust! If you don’t want that brownish look, make sure to wrap the crust borders with aluminum foil. It will have a better presentation, especially if you are serving this for your guest. This dinner recipe for kids goes great along with our caramelized carrot soup or our strawberry spinach salad! Do your kids love shrimp? What is your favorite dinner recipe for kids? 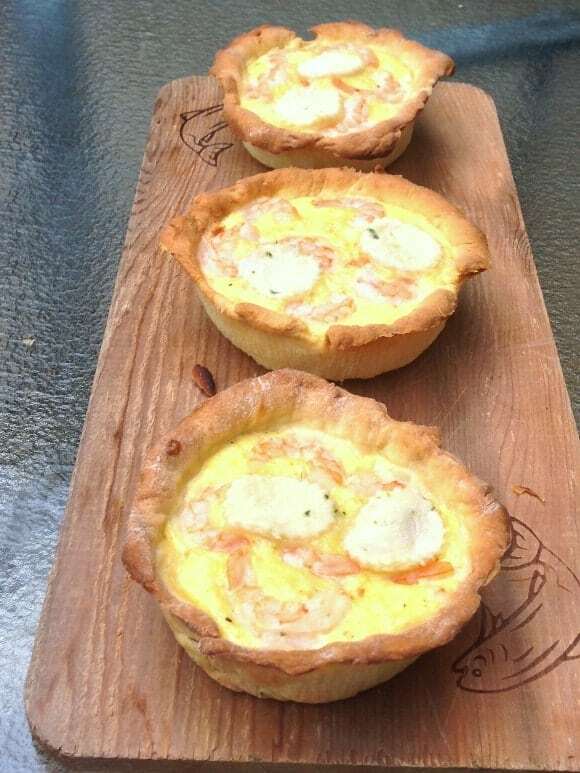 Whats better than a regular quiche? Mini ones with shrimp in them! Mmm mm! These would be great frozen and put into a lunch bag too! I love quiche! These look incredible. My kids just discovered they love shrimp so they are going to love this recipe. I love both shrimp and eggs so this sounds like a fabulous dish. I was thinking it would be great for lunch, served with a nice green salad. Thanks for the recipe. I love shrimp, we will need to try this. Now this looks like a awesome meal starter. I would love to make these for my next party! Love the ingredients and how easy it is to make! I bet the crust is so flaky and yummy!